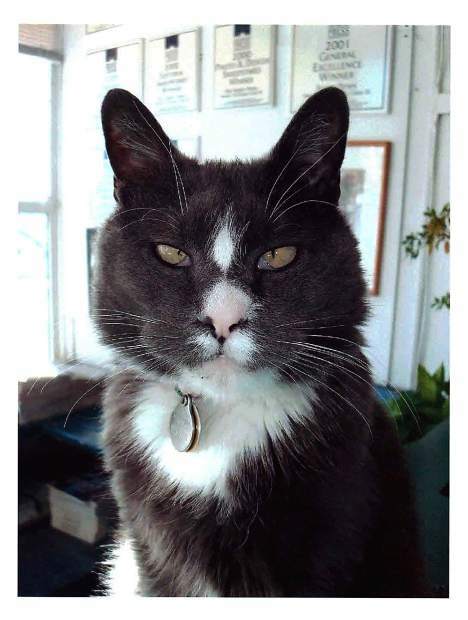 Scoop, esteemed mouser and mascot at The Aspen Times for some 17 years, died peacefully Monday at, to the best of anyone’s calculation, age 18. The longtime Aspen Times office cat had called the Aspen Animal Shelter home for the past couple of months, having returned to its embrace when the Times departed Scoop’s home on Main Street for its new offices in the MotherLode building. He was extremely well cared for there, enjoying lots of attention from shelter staff inside his own sunny room amid many birds. The newspaper adopted Scoop from the shelter in 1996, when its Main Street office building was unexpectedly infested with mice. Then-editor Andy Stone polled exasperated staffers — some of whom were convinced they’d contract hantavirus and others who were simply tired of brazen rodents running across their feet beneath the desks at night — on whether an exterminator or a cat should be summoned to deal with the problem. Staffers overwhelmingly chose the latter, and Scoop, a feisty, cross-eyed cat, proved up to the challenge. He was, as far as anyone remembers, the only pet to call the Times home, for he lived there continuously, but for a month or so early in his tenure, when he escaped out the back door and apparently sought refuge in the Hotel Jerome parking garage. He was eventually returned, in far leaner condition but otherwise none the worse for the ordeal. His name, much like his arrival, was decided by a staff vote — Scoop was the favored moniker over both Typo and Hanta. The soft gray-and-white feline quickly dispatched the invading mice. A tally of the nightly kill was posted in the old building’s kitchen each morning, as staffers discovered his victims scattered in the labyrinth of offices. The infestation was over within weeks, leaving Scoop to rest on his laurels, shed hair and nap, between regular patrols of the premises and playtime with Dottie Wolcott, the front-office manager and his devoted caregiver. Scoop owned the Times building in his early years, slinking around corners or leaping from one high perch to the next to avoid the daytime contingent of dogs as he made his rounds. He spent his final years almost exclusively in the front office, where he had a large selection of plush kitty beds from which to choose. As often as not, though, he’d curl up in the box of outgoing mail, plop in a front-office staffer’s lap or stretch out in the sunny front window on a stack of newspapers. His presence drew a wide range of visitors, though the prickly cat rebuffed the affections of many. Scoop would roll over and purr, stretching one paw and then the other in contentment while those he favored tickled his tummy or scratched the white underside of his chin, but retribution was swift for many an outstretched hand. Scoop will be fondly remembered as a member of The Aspen Times family, claiming his place among an eclectic assortment of staffers during the newspaper’s funky tenure in the funkiest of buildings.